Modern-day mapping allows us to create highly accurate, beautiful maps within a digital format. We love how this map combines digital precision with the alluring aesthetic of hand-drawn cartography. We see a charming representation of Iturup, an island situated between Russia and Japan. The mapmaker used ArcGIS Pro to layer in artist-drawn hachured mountains, adding charm and character. Reminiscent of an earlier era cartography, this multilingual map uses a black-and-white palette for all map elements, including its striking graticule, to accomplish stunning minimalism. Mapping the volcanic island of Iturup with individual hand-drawn mountain ranges immediately draws viewers into this area of disputed territory. The clever use of English, Japanese, Russian, and Ainu for the map's title contributes to the interesting history of this island, detailed within the map's text. Two carefully placed inset maps situate the island within its regional and global context. The stark palette and clean layout contribute to this map's legibility and beauty. Ideally, your map area will have a bit of relief in its terrain. Areas with more steep terrain will be more involved than those with flat spaces. Once you've found your map's area, add a hillshade layer. Esri's World Hillshade layer works well for this technique. Use a fine felt-tip pen to trace the hillshade at the scale you want for the final map. If you're using your computer screen as a light table, pay attention to the pressure when tracing to protect the screen. Trace sections of an additional reference layer such as roads. 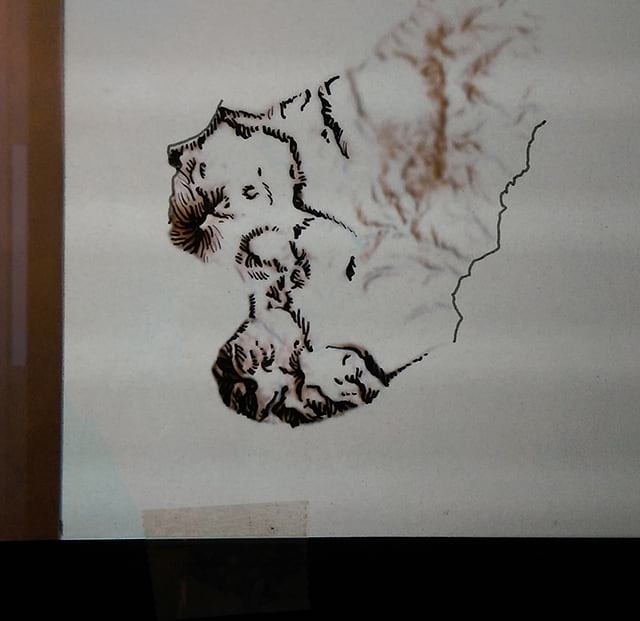 Scan your traced hillshade drawing. You will clean up the noise of the scanned image in ArcGIS Pro. If there are more obvious blemishes, you can use a program like Microsoft Paint or Adobe Photoshop to do some fine-tuning and cleanup. Identify ground control points that correspond with the additional reference layer you traced. Add control points to the traced image using the Georeference option in the Imagery tab in ArcGIS Pro. Repeat until the image aligns with the rest of the map. For the drawing portion, you will need tracing paper, tape, a fine felt-tip pen, and a scanner. For software, you will need to utilize ArcGIS Pro and Esri's World Hillshade layer. After tracing the World Hillshade layer, a scanned image of this drawing was georectified using the Georeferencing tool in ArcGIS Pro and specified control points spread throughout the map. This took approximately 30 hours total, which includes tracing, scanning, and georectifying the hand-drawn terrain. The remaining time was spent designing in ArcGIS Pro. When tracing, turn off all layers except for the hillshade and one simple reference layer, like roads or a rectangle of the map's extent. You will use this reference layer for georeferencing. Trace a few key sections from this reference layer. While you're working, try not to wrinkle, crease, or smudge the tracing paper. It may be difficult to remove these marks later. Tracing the image at the exact scale or larger than you want for the finished map will help prevent the lines of the drawing from being too thick in the final result. For fine lines, make your tracing paper twice as large as the intended finished map. Heather Smith is a cartographer and artist. She works at Esri designing and testing symbology features in ArcGIS Pro.